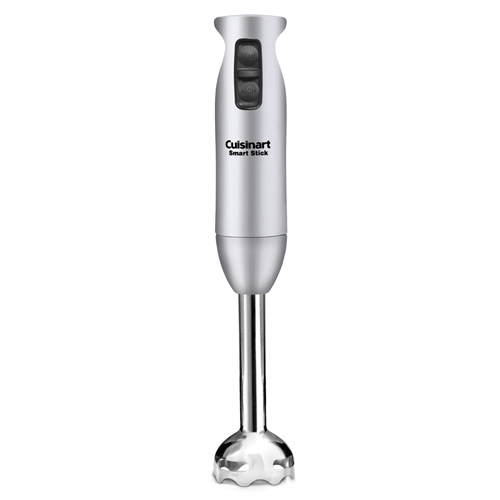 The Cuisinart CSB-75BC is a high-performance Smart Stick™ hand blender, with its 200-watt motor, two speeds, and deep reach. It makes quick work of pureeing soup in a pot or blending a pitcher of frothy hot chocolate. It can whip up lemonade and fruit smoothies in seconds, too. The Ergonomically designed grip offers comfortable hold and more control while blending. The 2 Speed Hand Blender Brushed Chrome Whisk Chopper Attach Beaker has many exciting features for users of all types. You can extend the lifetime of your 2 Speed Hand Blender Brushed Chrome Whisk Chopper Attach Beaker with the purchase of a FactoryOutletStore Factory Protection Plan. See the 2 Speed Hand Blender Brushed Chrome Whisk Chopper Attach Beaker product video above for more details. 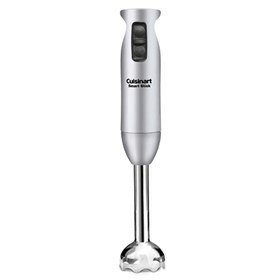 The 2 Speed Hand Blender Brushed Chrome Whisk Chopper Attach Beaker is sold as a Brand New Unopened Item.